In some cases, authors may want user agents to render content that does not come from the document tree. One familiar example of this is a numbered list; the author does not want to list the numbers explicitly, he or she wants the user agent to generate them automatically. Similarly, authors may want the user agent to insert the word "Figure" before the caption of a figure, or "Chapter 7" before the seventh chapter title. For audio or braille in particular, user agents should be able to insert these strings. The 'content' property, in conjunction with the :before and :after pseudo-elements. Elements with a value of 'list-item' for the 'display' property. would cause a solid green border to be rendered around the entire paragraph, including the initial string. The :before and :after pseudo-elements inherit any inheritable properties from the element in the document tree to which they are attached. In a :before or :after pseudo-element declaration, non-inherited properties take their initial values. The :before and :after pseudo-elements elements interact with other boxes, such as run-in boxes, as if they were real elements inserted just inside their associated element. Text content (see the section on strings). The value is a URI that designates an external resource. If a user agent cannot support the resource because of the media types it supports, it must ignore the resource. Counters may be specified with two different functions: 'counter()' or 'counters()'. The former has two forms: 'counter(name)' or 'counter(name, style)'. The generated text is the value of the named counter at this point in the formatting structure; it is formatted in the indicated style ('decimal' by default). The latter function also has two forms: 'counters(name, string)' or 'counters(name, string, style)'. The generated text is the value of all counters with the given name at this point in the formatting structure, separated by the specified string. The counters are rendered in the indicated style ('decimal' by default). See the section on automatic counters and numbering for more information. These values are replaced by the appropriate string from the 'quotes' property. Same as 'none', but increments (decrements) the level of nesting for quotes. This function returns as a string the value of attribute X for the subject of the selector. The string is not parsed by the CSS processor. If the subject of the selector doesn't have an attribute X, an empty string is returned. The case-sensitivity of attribute names depends on the document language. Note. In CSS 2.1, it is not possible to refer to attribute values for other elements than the subject of the selector. The 'display' property controls whether the content is placed in a block, inline, or marker box. Generated content does not alter the document tree. In particular, it is not fed back to the document language processor (e.g., for reparsing). In CSS 2.1, authors may specify, in a style-sensitive and context-dependent manner, how user agents should render quotation marks. The 'quotes' property specifies pairs of quotation marks for each level of embedded quotation. The 'content' property gives access to those quotation marks and causes them to be inserted before and after a quotation. The 'open-quote' and 'close-quote' values of the 'content' property produce no quotation marks. Values for the 'open-quote' and 'close-quote' values of the 'content' property are taken from this list of pairs of quotation marks (opening and closing). The first (leftmost) pair represents the outermost level of quotation, the second pair the first level of embedding, etc. The user agent must apply the appropriate pair of quotation marks according to the level of embedding. Quotation marks are inserted in appropriate places in a document with the 'open-quote' and 'close-quote' values of the 'content' property. Each occurrence of 'open-quote' or 'close-quote' is replaced by one of the strings from the value of 'quotes', based on the depth of nesting. 'Open-quote' refers to the first of a pair of quotes, 'close-quote' refers to the second. Which pair of quotes is used depends on the nesting level of quotes: the number of occurrences of 'open-quote' in all generated text before the current occurrence, minus the number of occurrences of 'close-quote'. If the depth is 0, the first pair is used, if the depth is 1, the second pair is used, etc. If the depth is greater than the number of pairs, the last pair is repeated. A 'close-quote' that would make the depth negative is in error and is ignored (at rendering time): the depth stays at 0 and no quote mark is rendered (although the rest of the 'content' property's value is still inserted). Note. The quoting depth is independent of the nesting of the source document or the formatting structure. Some typographic styles require open quotation marks to be repeated before every paragraph of a quote spanning several paragraphs, but only the last paragraph ends with a closing quotation mark. In CSS, this can be achieved by inserting "phantom" closing quotes. The keyword 'no-close-quote' decrements the quoting level, but does not insert a quotation mark. This relies on the last paragraph being marked with a class "last". For symmetry, there is also a 'no-open-quote' keyword, which inserts nothing, but increments the quotation depth by one. Automatic numbering in CSS2 is controlled with two properties, 'counter-increment' and 'counter-reset'. The counters defined by these properties are used with the counter() and counters() functions of the the 'content' property. The 'counter-increment' property accepts one or more names of counters (identifiers), each one optionally followed by an integer. The integer indicates by how much the counter is incremented for every occurrence of the element. The default increment is 1. Zero and negative integers are allowed. The 'counter-reset' property also contains a list of one or more names of counters, each one optionally followed by an integer. The integer gives the value that the counter is set to on each occurrence of the element. The default is 0. If 'counter-increment' refers to a counter that is not in the scope (see below) of any 'counter-reset', the counter is assumed to have been reset to 0 by the root element. This example shows a way to number chapters and sections with "Chapter 1", "1.1", "1.2", etc. If an element increments/resets a counter and also uses it (in the 'content' property of its :before or :after pseudo-element), the counter is used after being incremented/reset. If an element both resets and increments a counter, the counter is reset first and then incremented. Counters are "self-nesting", in the sense that re-using a counter in a child element automatically creates a new instance of the counter. This is important for situations like lists in HTML, where elements can be nested inside themselves to arbitrary depth. It would be impossible to define uniquely named counters for each level. The self-nesting is based on the principle that every element that has a 'counter-reset' for a counter X, creates a fresh counter X, the scope of which is the element, its following siblings, and all the descendants of the element and its following siblings. In the example above, an OL will create a counter, and all children of the OL will refer to that counter. If we denote by item[n] the nth instance of the "item" counter, and by "(" and ")" the beginning and end of a scope, then the following HTML fragment will use the indicated counters. (We assume the style sheet as given in the example above). The 'counters()' function generates a string composed of the values of all counters with the same name, separated by a given string. The following style sheet numbers nested list items as "1", "1.1", "1.1.1", etc. All the styles are allowed, including 'disc', 'circle', 'square', and 'none'. An element that is not displayed ('display' set to 'none') cannot increment or reset a counter. For example, with the following style sheet, H2s with class "secret" do not increment 'count2'. Elements with 'visibility' set to 'hidden', on the other hand, do increment counters. 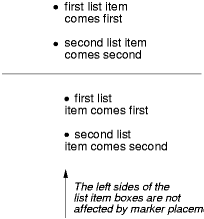 CSS 2.1 offers basic visual formatting of lists. An element with 'display: list-item' generates a principal box for the element's content and an optional marker box as a visual indication that the element is a list item. The list properties describe basic visual formatting of lists: they allow style sheets to specify the marker type (image, glyph, or number), and the marker position with respect to the principal box (outside it or within it before content). They do not allow authors to specify distinct style (colors, fonts, alignment, etc.) for the list marker or adjust its position with respect to the principal box, these may be derived from the principal box. The background properties apply to the principal box only; an 'outside' marker box is transparent. This property specifies appearance of the list item marker if 'list-style-image' has the value 'none' or if the image pointed to by the URI cannot be displayed. The value 'none' specifies no marker, otherwise there are three types of marker: glyphs, numbering systems, and alphabetic systems. Glyphs are specified with disc, circle, and square. Their exact rendering depends on the user agent. A user agent that does not recognize a numbering system should use 'decimal'. This specification does not define how alphabetic systems wrap at the end of the alphabet. For instance, after 26 list items, 'lower-latin' rendering is undefined. Therefore, for long lists, we recommend that authors specify true numbers. The list marker alignment (here, right justified) depends on the user agent. The marker box is outside the principal block box. CSS 2.1 does not specify the precise location of the marker box. Although authors may specify 'list-style' information directly on list item elements (e.g., "li" in HTML), they should do so with care. The following rules look similar, but the first declares a descendant selector and the second a (more specific) child selector.